Mark’s passion is for the blues and he can clearly recall that the first tune he ever learned was Freddy King’s ‘Hideaway’ so he’s naturally interested in some of Carolan’s previous blues players such as Jimmy Wiggington and Joe Barber from way back in post 33. He recalls how, like many, he began learning from books, but now increasingly draws on tracks transcribed by his teacher from CDs or from YouTube videos which reveal new licks, tricks and cheats – “I always cheat … of course I cheat … I might have looked at other blues licks in E or A”. He then expands on the possibilities of connecting a guitar like Carolan to learning materials, especially for recommending specific videos to guide a particular learner: “If you were learning ..you were doing GCSEs or you were doing other grades it could point to a piece that was the next grade up … or this is another piece at the grade you have played .. or I suppose you could even get it to rate how well you had played that.” Mark notes how such a guitar would in a sense “always be pointing at the future of how you might play or how you might get better” as well as pointing to its past history – of what had been played. The conversation turns to the embodied nature of playing and learning a musical instrument as described in David Sudnow’s book ‘Ways of the Hand’, a rich ethnographic account of the embodied nature of learning to play jazz piano. As Mark observes of learning the guitar: “it (Ways of the Hand) always felt truer to me as account of what it means to play guitar … you are holding this thing … it has a shape like a body… the shape of your hand – left hand in my case … it fits to the neck and you learn various positions for the hand”. This raises the question of whether directly co nnecting a physical instrument to learning materials such as recommended videos could somehow support embodied learning? How might such connections be called upon while playing in lessons and practice? 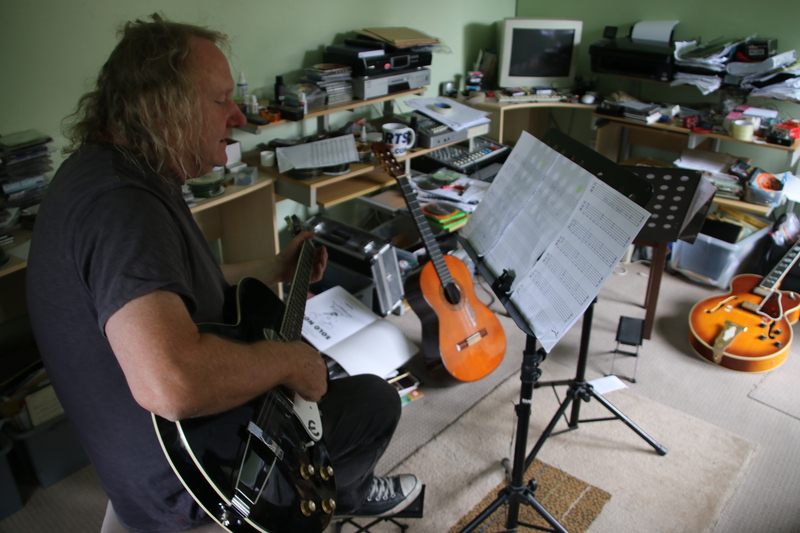 Related to our previous post, Mark also opens up the question of how the guitar might sense interactions, in this case recording and potentially even analysing the efforts of learners. Might “sensors up the fretboard” tell you whether you were playing correctly and recommend suggestions for alternative fingerings? Or might Shazam-like applications recognize the melodies or chord sequences you are practicing so the guitar could recommend related songs to try?